So you’ve decided to build a mobile app for your business and you’re probably trying to figure out which of the main 3 options – native, web or hybrid applications – you should go for. Our advice to you is the same as we advise our clients – the type of application you decide to build should balance 5 main criteria: performance, user experience, cost, time to market and maintenance. Now this is not a simple choice and it requires thorough consideration and analysis of each business case. But to make things easier for you we are further running all three types of applications against the criteria and create a cross reference chart for your future use. Native apps are designed to run on specific mobile platforms like Android or iOS. An application written for an Android device will not work on an iOS device. But because they are platform specific they provide the best performance on that particular platform. Of the 3 app types, they also provide the best user experience because of their platform specific design since the user is already accustomed with native UI components and other nitty gritty of the platform. They are very fast and can easily interact with the device capabilities like GPS, storage and camera. They also allow you to send push notifications and hence you can reach out to your customers to get repeat business. The downside of running on only one platform is that you will need to build separate applications for each different platform. If you wish to use both iOS and Android, you will need to develop two native apps instead of one hybrid or web app. This means almost double the time and double the effort to maintain the apps, hence the extra costs. However, if you are looking to provide the best possible user experience and high performance, native apps are your best option. Be patient with time and ready to deal with higher budget requirements. But on the flip side they need a browser to run and they cannot be downloaded from app stores like other apps. They are usually slow and are also much less interactive as compared to the native apps. Most of them cannot access other device capabilities like camera, GPS and storage. If you are facing time as well as budget constraints and you focus to launch an app as soon as possible to reach out to a large number of users then web apps are probably your best option to begin with. Later on you can switch to either native or hybrid apps to cover for the shortcomings of the web apps. They can be downloaded from your typical app store and they do not need a browser to run. Hybrid apps can also easily access other capabilities of the device like gallery, camera or GPS. The disadvantage of hybrid apps is that they are slower as compared to native apps but the time required to design a hybrid app is typically shorter than a native app. User experience may not be as good as that of a native app because the app tries to emulate the platform’s native graphics and visuals using web technologies. So, if you are in one of those situations where web apps are not suited and native apps are taking too long to develop, then hybrid apps are your best bet. They will allow you to reach a large user base at an arguably lower cost when compared with native apps. Though the performance may not be as good as the native apps, hybrid apps will save you time and money, allow access to all the device features and you can easily scale up when required for a different platform. Time to market: Web apps require the least time to build followed by hybrid apps. If you are making a choice only between hybrid and native apps and time is a constraint then hybrid apps allow you to reach the market in less time and provide enough phone’s capabilities on your app to keep your users engaged. 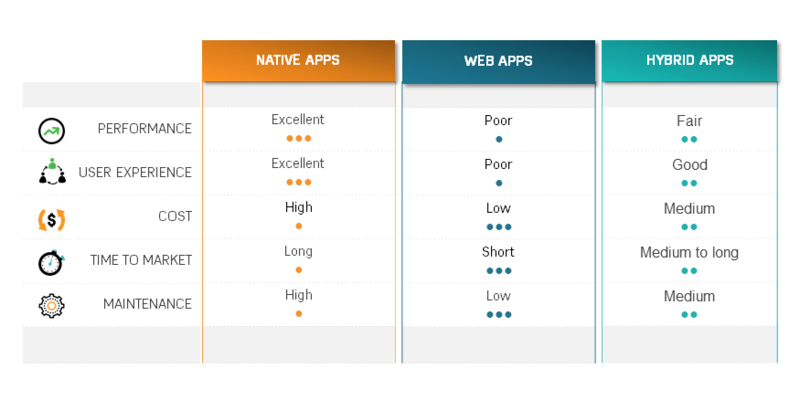 Performance: Native apps being suited to the particular platform outperform web and hybrid apps. Cost: Web apps are the cheapest to build because there is no need to adapt the code to the specifics of the platform; native apps require the highest budget considering you need to build different apps for different platforms. User experience: If user experience is the most important criteria in your mind while you are looking to build an app for your business then native apps are the best. Having said that hybrid apps also provide good user experience just that they have a different feel as compared to the platform the user is already familiar with. Maintenance: Web apps and hybrid apps are easier to maintain. Native apps on the other hand are slightly more complicated because you have to take care of different codebase for different platforms. For a thorough and customized assessment of your business case however we recommend you contact a specialized provider for professional consultancy.